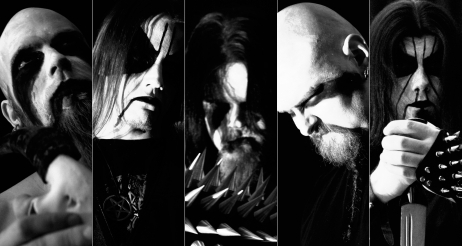 Finnish black metal band Alghazanth moved me with their fifth album The Wreath of Thevetat. Their outstanding works enticed me to check the follow-up album Vinum Intus. The songs like ‘With a Thorn in Our Hearts‘ and ‘For Thirteen Moons‘ are just awestricken. I was more curious on the new full-length. If Alghazanth could again pull me under their spell? I’ll answer that question a bit later. Firstly to say, there have been a few small changes in the band. After singer Goat Tormentor has left the band, Thasmorg has now taken over the vocal duties and changed simultaneously from the guitar to bass and guitarist Mordant raised as a new member. So much for that. Let’s come to the album itself. To my question posed above, whether Alghazanth would pull me back into their spell, just to answer already, I can say in short: Yes, they have. Right from the 9- minute opener ‘In Your Midnight Orchard‘, the Finns are packed. The melody is just awesome. The first 50 seconds is of absolute madness. Then the storm breaks and blast beats dominate the song, but with strong melodic background with some acoustic interludes. The vocal varies his pitches accordingly, a strong opener to a good album. The sheer madness continues with ‘Pearl of High’. This song starts in mid-tempo with from time to time short double bass attacks, which are still continued even during the short blasts. But what have exalted above all in this 7- minute song are the divine melodies. The keyboards buried somewhat in the background in this record. ‘Promethean permutation‘ is also held mostly in mid-tempo , but every now and again , interrupted by short double bass attacks , which are backed by a strong melody sheet. By the way, the song is playing sometimes scarce 7 minutes. ‘AdraMelekTaus‘ was indeed published as an advance EP. The song definitely turns the album into another level. Above all, the short double-track vocal passages of the song are horny here. ‘As It Is Faded’ begins quietly with an acoustic guitar and a relaxed keyboard sound- then comes the typical Alghazanth’s strikes. Up next, ‘With Sickle, Scythe With’, which lengths less than 10 –minute, but an mind-boggling track. Band’s typical trademarks are combined here once again. Lots of melodies, double bass driving, blast beats and a quiet acoustics conjointly put an end of the song and at the same time of the album. So, to make it again to say: Alghazanth managed to pull me from one second to the last second of ‘The Three -Faced Pilgrim’ in its spell and not let go. 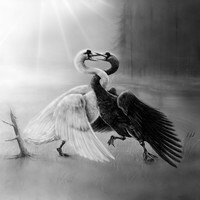 They also prove here again that melody and Black Metal can go very well together. I can still complain about the keyboards not being so prominent, but still it saturates with the metalness of the sound, to create an epic atmospheric background. I just love it. I would not pay a particular attention to any songs; rather I will list up the album as one of the best black metal albums in 2013. It’s not over praised at all from the other critics, but I will obviously give the overall efforts a resounding thumbs up.